PLC (planar lightwave circuit) splitters regulate the power of optical signals via splitting and routing, delivering reliable light distribution. They have a broader operating wavelength range (1260-1650 nm) than low-cost fused biconic tapered (FBT) couplers. The technology offers a comprehensive temperature range, featuring improved uniformity, enhanced reliability, and a smaller size compared to FBT couplers. The mechanism behind PLC structures has been recently developed. It enables the design of application solutions requiring more sizable split configuration by fabricating waveguides utilizing lithography on a substrate composed of silica glass. This permits the channeling of calculated amounts of light in percentage form. The end result is the construction of PLC splitters with the ability to provide highly accurate and uniform splits with minimal losses. 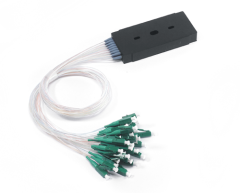 Fiber optic splitters such as PLC units are key optical devices for use with passive optical network (PON) systems. Also sometimes called passive optical splitters, they fragment optical signal power equally to all output ports. In a PON field plant, the element is positioned on an electric pole. The pole connects the distribution optical cable located in the air as well as the drop wire to the user's premises. Fused biconical (FBT): FBT elements are constructed from widely available resources such as fiber and steel. The low cost of the constituents makes the components relatively inexpensive. Splitters of this type support three wavelengths (850/1310/1550 nm), and are incapable of operating at other wavelengths. This limited capacity makes these units less diverse in usage than PLC alternatives. They are temperature sensitive and malfunction when used outside their supported temperature range. In addition, lack of signal management capability prevents signals from evenly splitting. Planar lightwave circuit (PLC): Given a more advanced construction, PLC units do not face the same limitations as FBT products. They are built with a system akin to semiconductor technology, resulting in greater potential functionality and increased manufacturing costs. The exploitation of lithographic etching in the production process allows for compact designs. They operate in a wider scope of temperatures than FBT items and possess a higher split ratio. This leads to superior functionality and permits equal splitting of a signal. The devices work with an extensive array of wavelengths, allowing for adjustment when necessary. Other pros and cons of PLC splitters are listed below. Splitters incorporated in passive optical networks (PON) enable fiber to the home (FTTH) networks to facilitate sharing an individual PON network interface with many subscribers. The components require no power and feature no electronics. They are passive devices available in a comprehensive coverage of different split ratios. PON networks feature either an individual PLC element or multiple units linked together in a cascade. Adding extra splitters to a system increases attenuation. As a result, a single splitter installation is preferred to cascades of multiple devices. Each supplementary coupling of two combined structures adds one additional unit of attenuation. PLC splitters are capable of deployment in a central office (CO) by an OLT, or inside an outside plant (OSP) cabinet located closer to subscribers. The equipment is sometimes placed in basements when integrated into multiple dwelling unit (MDU) installations. The older technology employed in the configuration of FBT products adds more loss to a network than PLC components. FBT options produce higher attenuation than the PLC alternatives. PLC splitters are incorporated in passive optical networks (PONs) to split optical signal throughput.